A recent consolidation of Vatican media has swallowed up your old “Pope App” which is now called Vatican News (Free) Apple | Android. If you have the old blue/yellow app installed, it will automatically switch to the re-branded red/white app. You don’t have to do a thing. As the name suggests, this re-branded Vatican News app provides newsy up-to-date (even live!) content connecting you with all things dealing with not just the Pope, but the Vatican, the Church and (Catholic) World in those four categories. This app was developed by the Vatican’s relatively new Secretariat for Communication as the official “network hub of Vatican communications” based on its web site. So, while it still follows the pope, it also encompasses the entire Holy See and anything concerning the universal Church that would be of interest to the masses. In covering the pope, the app includes official papal-related content in a variety of formats: his Twitter feeds (@Pontifex), news, synopsis articles of his daily homilies, photos, some official text and, of course, video. Regrettably, gone is the all-access pass to Pope Francis with his calendar schedule, list of writings, (you have to jump over to the Vatican web site for that) and the galleries with the latest images and videos in one convenient place (now farmed out to social media). Also gone is the terrific option to have the app send an alert when something momentous takes place like the Live Christmas and Easter messages or some event on a papal trip. Pope-related links are provided for social media content: Instagram–now the place for galleries; Facebook-Vatican page (the pope himself does not have a personal Facebook page because that outlet is a cesspool that also weeds out politically incorrect content); YouTube –live and on demand video found here; and the pope’s Twitter feed –another content-discriminated cesspool, but necessary. What you can’t do is forecast when something cool will happen because it lacks a timeline/schedule. So at what time here in the east coast of the United States do I tune in to hear the Pope’s live Easter message for the world? I used to know with the old Pope App. It also used to send me a push notification as it was about to occur. If you want an app that exclusively covers the pope, this app is still the best one out there. Finally, we regret that some of the more interesting things the pope says and does are still NOT included in this app. So when he accepts a clandestine meeting with an individual or group, or says something off-the-cuff, or crazy, don’t expect to see it on this app. 6 languages: English, French, Italian, Portuguese, Spanish, German. Requires internet service. Pray with Pope Francis! Did you know that each month the Pope announces his specific prayer intentions? These prayers are generally aimed at particular challenges facing humanity and the mission of the Church. Click To Pray app is designed to help people around the world to pray along with Pope Francis in these particular intentions of his. To encourage you stay engaged in daily prayer, the app gives you the ability to send reminders to your smart phone three times a day, morning, afternoon and evening–a different prayer or reflection each time. 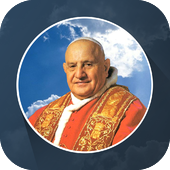 Brought to you by the Apostleship of Prayer, a Jesuit organization, the Click To Pray app is available in English, Spanish, Portuguese, and French enabling people from around the world to unite their prayers with the Pope’s. In addition to the prayer reminders, registered users may post a prayer on the app/website Prayer Wall and share them on social media. Selfie with Pope Francis (free) Android Just for fun, here’s your opportunity to create a selfie with the pope. Download the app and follow the instructions. These apps are designed for use by participants in Rome at the canonization AND we folks staying home. The apps come in several languages: Italian, English, French, Spanish, Portuguese, Chinese. The obvious omission is Polish (?! really ?!) You don’t need the schedule of events during the course of the weekend or travel help, but what is still valuable are a few other salient features. Check out archived videos of the two popes, read their encyclicals, read about why they have been designated “saint,” pray their official prayers and read their biographies. You will find language options in the “settings” tab on the home screen. Ours defaulted to English as we downloaded in the United States off iTunes here. eVotion Saint (Bl.) 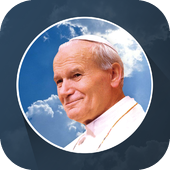 John Paul II (Free) Apple eVotions are a series of digital Catholic devotions. This one is designed around Saint Pope John Paul II who was canonized on 27 April 2014. You get image galleries, streaming video, and push notifications for praying novenas. The app also offers common prayers, introductions by well-known Catholics, and writings on the tradition and history of each saint and blessed, according to developers.